The World Bank has approved a new energy initiative that will severely limit funding of coal-fired power plants and projects around the world, meaning developing countries could be unable to obtain access to cheap electricity. “It will make a difference. [It will] be more expensive for underdeveloped countries to obtain the cheapest form of electricity,” Milton Catelin, Chief Executive for the World Coal Association, told FoxNews.com. “I think the World Bank has moved away from their original purpose and they have failed with poverty eradication so they are jumping on the climate control bandwagon. “But for the benefit of society as a whole, they [the World Bank] should be at a balance between eradicating poverty and climate control,” he added. Its “Energy Sector Directions Paper” also said it would increase backing of hydroelectric power, which it had originally abandoned nearly two decades ago. Officials from the World Bank told FoxNews.com that while they are now operating under the new energy initiative, they would look at energy-related issues on a case-by-case basis. “We think that there will be a certain amount of countries within the next ten years that will not be able to use another viable source of energy,” said Rachel Kyte, Vice President Sustainable Development for the World Bank. “We don’t want to turn around and say that they will have to wait fifteen years for a new source. She added that the World Bank will make allowances for Greenfield coal power generation on a case-by-case basis. The Greenfield method involves an “end point” for a power plant, when its land is restored to its original condition. The World Bank has been going in a new direction under current president Jim Yong Kim, the first scientist to head the group, and has taken a more aggressive stance on climate change. In the past, multilateral organizations have been criticized for urging global action to cut carbon dioxide emissions while funding coal-powered plants at the same time. 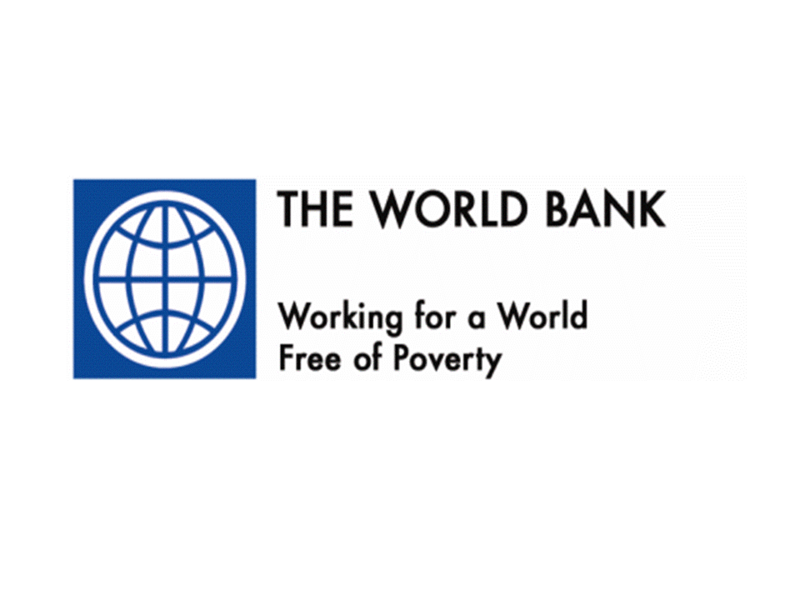 The World Bank previously defended itself by saying some of the poorest countries in the world have no other choice and need energy from coal to end poverty. Now, Catelin said, “The reality is that they listen to the administration in Washington which has taken a negative stance on coal. (Reuters) – President Dilma Rousseff plans to cut and simplify taxes for electricity producers and distributors, two senior officials told Reuters, as part of a strategy to reduce Brazil‘s high business costs and stimulate its struggling economy. Brazil has been on the brink of recession since mid-2011 as high taxes, an overvalued exchange rate and other structural problems squeeze what had previously been one of the world’s most dynamic emerging economies. Rousseff has in recent months announced targeted tax cuts for stagnant sectors such as the automotive industry, embracing an incremental approach to reform that has drawn criticism from investors who say more drastic changes are needed. But the officials, who spoke on condition of anonymity, said the tax reductions for electricity companies would likely be the most far-reaching to date. They said Rousseff will announce the plans in coming weeks. Brazil has the world’s third-highest power costs so Rousseff is aiming to give relief to consumers as well as companies in energy-intensive areas such as steel and petrochemicals. Internal government studies suggest that, depending on which taxes are cut, electricity costs could fall by between 3 and 10 percent starting as early as 2013, the officials said. That would have a measurable impact on inflation, and thus aid Rousseff’s quest to push Brazilian interest rates lower. Rousseff probably will not pass the tax cuts by decree, so she will have to negotiate them with Congress and other groups. She plans to use her record-high popularity ratings to push through cuts to taxes at both the federal and state level, with a special focus on eliminating levies that overlap or are difficult to calculate, the officials said. Brazil’s tax code is so complex that an average company spends 2,600 hours a year calculating what it owes, according to the World Bank‘s annual Doing Business study, which compares business practices around the world. That is almost 14 times the time needed to do taxes in the United States, and by far the highest among the 183 countries in the bank’s survey. “The focus is as much on simplifying taxes as reducing them,” a second official said. Brazil’s electricity industry includes state-run companies such as Eletrobras (LIPR3.SA) as well as multinationals like AES Corp. (AES.N) and GDF Suez (GSZ.PA). Hydroelectric power supplies about three-quarters of Brazil’s electricity needs, with nuclear, thermal and wind power accounting for the rest. If the initiative is successful, Rousseff will use a similar blueprint to reduce taxes for other industries in coming months, possibly including telecoms, the officials said. Specific details such as the size of the tax cuts, which taxes will be targeted, and the timing of the announcement are still being finalized by Rousseff’s team, the officials said. One said the plan would likely be unveiled in late June, before politicians nationwide turn their attention to municipal elections in October. Electricity prices are a big component of the so-called “Brazil cost” – the mix of taxes, high interest rates, labor costs, infrastructure bottlenecks, and other issues that have caused the economy to become less competitive. After a decade of strong performance, Brazil grew below the Latin American average in 2011 and so far this year. Brazil’s average electricity cost of $180 per megawatt hour is exceeded only by Italy and Slovakia, the Getulio Vargas Foundation, a private think-tank, said in a 2011 study based on data from the International Energy Agency. High electricity rates have contributed to stagnant investment and production in energy-intensive industries. Despite Brazil’s bauxite and alumina resources, no new aluminum factories have been built in Brazil since 1985 and two have closed, keeping production levels stagnant, the Getulio Vargas study said. It added that electricity accounts for 35 percent – “an insane proportion” – of the industry’s production costs. Pittsburgh-based aluminum producer Alcoa (AA.N) said in April it was considering big production cuts at two of its Brazil factories in part because of high electricity costs. One of the officials who spoke to Reuters said the situation at Alcoa had added urgency to Rousseff’s plan to cut taxes. All told, taxes account for about half of the cost of electricity in Brazil, studies show. The taxes themselves are roughly evenly split between the federal and state level. Cutting or simplifying taxes at the federal level will be relatively straightforward for Rousseff. However, she also believes she can push through tax cuts at the state level by using leverage from upcoming debt negotiations. Several states are asking for lower interest rates on debt they owe the federal government. Rousseff will likely ask the states to simplify or cut their taxes on electricity in return, one of the sources said. The left-leaning president will also ensure that any tax relief is fully passed along to consumers, the officials said. Although the electricity sector is partly privately controlled, Rousseff believes she can use the pricing power of state-run companies to effectively push rates lower if needed, they said. An upcoming renegotiation of concessions in the industry could also be an opportunity to push for lower rates. Her government has frozen billions of dollars in spending, allowing the central bank to slash its benchmark interest rate by 3.5 percentage points since August. When some private-sector banks balked at lowering rates for consumers, Rousseff and senior officials publicly hectored them for having some of the world’s largest spreads. State-run banks then announced lower interest rates for customers, and the private banks soon yielded and followed suit. Such tactics have caused friction between Rousseff and some members of the business community, especially banking executives, who privately accuse her of trying to bully the private sector. Yet the officials said Rousseff is using the best tools available to her to restore Brazil’s competitiveness. Congress blocked attempts at a comprehensive tax reform by her predecessor as president, and Rousseff, herself a former energy minister, believes the only politically viable alternative is to move one sector at a time, they said. Huge Water Resource Found in Africa: World Bank Steps In? Free-Market Analysis: We’ve charted this elite meme for several years – water scarcity. The powers-that-be create fear-based scarcity promotions and then propose globalist solutions. Water scarcity is a big promotion for them – and this meme is a central one these days. Right on schedule, it’s been determined that Africa has water after all. Of course, Western scientists had to make this determination. This is part of the larger “cult of the expert” that the elites seek to inculcate. Until it can be documented by elite facilities, it doesn’t exist. Now scientists have for the first time been able to carry out a continent-wide analysis of the water that is hidden under the surface in aquifers. Researchers from the British Geological Survey and University College London (UCL) have mapped in detail the amount and potential yield of this groundwater resource across the continent. Helen Bonsor from the BGS is one of the authors of the paper. She says that up until now groundwater was out of sight and out of mind. She hopes the new maps will open people’s eyes to the potential. “Where there’s greatest ground water storage is in northern Africa, in the large sedimentary basins, in Libya, Algeria and Chad,” she said. “The amount of storage in those basins is equivalent to 75m thickness of water across that area – it’s a huge amount.” Due to changes in climate that have turned the Sahara into a desert over centuries many of the aquifers underneath were last filled with water over 5,000 years ago. The scientists collated their information from existing hydro-geological maps from national governments as well as 283 aquifer studies. The researchers say their new maps indicate that many countries currently designated as “water scarce” have substantial groundwater reserves. Note: the scientists didn’t really discover anything new. They “collated” their findings “from existing hydro-geological maps from national governments as well as 283 aquifer studies.” In other words, it was all a promotion, folks. “Parched Africa” was never more than an elite scarcity campaign. The maps showing plenty of water were there all along. So what now? Having discovered that Africa has plenty of water, will the private market be left to make its magic? Not so fast. A simple Internet search shows us that the other shoe may be dropped. That shoe, of course, would be globalist involvement. The whole point of creating scarcity memes is to propose globalist solutions that bring us closer to the world government so avidly sought by the powers-that-be. Finance required to raise infrastructure in Sub Saharan Africa to a reasonable level within the next decade is estimated at $93 Billion every year, a World Bank report has shown. The estimates cover the Information Communication Technology, Irrigation, Power, Transport and Water Supply and Sanitation sectors. Of the total required, existing expenditure is estimated at $45 Billion per annum and after accounting for efficiency gains of $17 Billion, the funding gap remains at about $31Billion. ‘Infrastructure is a cardinal challenge facing Africa, thereby creating room for the inability of Africa to key into the avalanche of economic and commercial opportunities available in the continent,’ says Kenneth Okpara, Commissioner for Economic Planning, Delta State during March Breakfast forum of Nigerian-South African Chamber of Commerce sponsored by Warri Industrial Business Park. Okpara noted that Africa’s infrastructure stocks and quality is among the least in the world, noting that lack of good governance is a major problem that prevents the continent from taking its rightful place as regards socio-economics. ‘One approach to address this challenge is to facilitate the increase of private provision of Public–Private Partnership (PPP),’ he notes, saying that the partnership assumes transactions where the private sector retains a considerable portion of commercial and financial risks associated with a project. Okpara added that leveraging private sector financing through public private partnership and capital market (bonds) are the means through which the gap can be addressed. It is fairly predictable, is it not? Africa suffers from a water problem – that turns out not to exist. But having raised the alarm, Western facilities stand ready to help. Chief among them is the World Bank that will provide much needed cash to reap the benefits of these aquifers, etc. What may occur is wearily predictable. The World Bank lends cash to corrupt governments that squander or loot resources. The “country” is eventually unable to pay and the IMF arrives to impose “austerity” – including higher taxes and an asset sale. Thus the powers-that-be consolidate command and control. Global governance – or at least its influence – expands. Conclusion: Thanks to the Internet, we can clearly see the patterns now. Africa, in our view, is being readied for significant Western exploitation and it is no coincidence they are reappearing here – and now. Comments Off on Huge Water Resource Found in Africa: World Bank Steps In? Over the past couple of weeks, George Soros, the IMF and the World Bank have all issued incredibly chilling warnings about the possibility of an impending economic collapse. Considering the power and the influence that Soros, the IMF and the World Bank all have over the global financial system, this is very alarming. So are they purposely trying to scare the living daylights out of us? Soros is even warning of riots in the streets of America. Unfortunately, way too often top global leaders say something in public because they want to “push” events in a certain direction. Do George Soros and officials at the IMF and World Bank hope to prevent a worldwide financial collapse by making these statements, or are other agendas at work? We may never know. 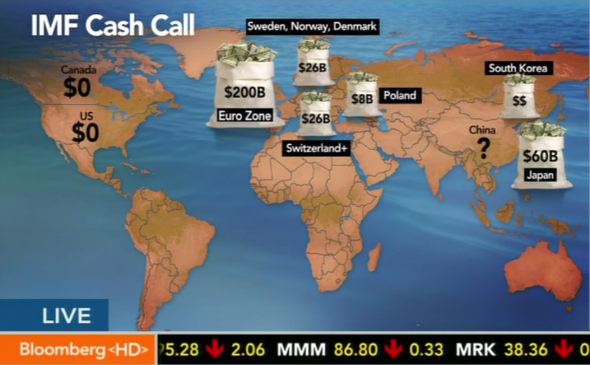 But one thing is for sure – many of the top financial officials in the world are using language that is downright “apocalyptic”, and that is not a good sign for the rest of 2012. Right now, George Soros is saying things that he has never said before. 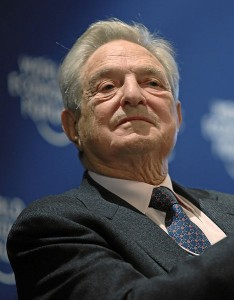 Just check out what George Soros recently told Newsweek…. Later on in that same article, Soros is quoted as saying that we could soon see the U.S. government using “strong-arm tactics” to crack down on rioting in the streets of major U.S. cities…. Well, George Soros is publicly warning that the coming financial crisis could end up being even worse than 2008. Just check out the following quotes from him that appeared in a recent Businessweek article…. Once again, the head of the IMF, Christine Lagarde, has made a speech in which she openly warned that we are heading for a repeat of the “1930s”. She told an audience in Berlin on Monday that the globe is facing “a 1930s moment, in which inaction, insularity and rigid ideology combine to cause a collapse in global demand”. During the speech she called for a trillion more dollars to support financially troubled governments, and she made the following statement…. The lead author of the report, Andrew Burns, said that the “importance of contingency planning cannot be stressed enough” and that if there is a major financial crisis in Europe the entire globe will be deeply affected…. A lot of folks in the investment world are warning that hard times are about to hit us as well. For example, the following is what legendary investor Joseph Granville recently told Bloomberg Television…. Those that believe that the United States can somehow escape the coming financial storm don’t really know what they are talking about. An environment for a “perfect storm” is developing, and most Americans have absolutely no idea what is about to happen. Fortunately, there are some researchers out there that are working hard to sound the alarm bells. For example, the following quote comes from a recent interview with Gerald Celente…. I believe that we have to watch out for something along the lines of an economic martial law. The European system is in collapse. The financial system in the United States is just as tenuous, if not more, and I believe they will not admit there will be a financial crash but rather they will use a geo-political issue to get the people in a state of fear and hysteria whereby they’ll then call a bank holiday or devaluation of the currency, or a hyperinflation of the currency, and blame it on somebody else. Just because things have “always” been a certain way does not mean that they will continue to be that way. Just because certain things have “always” worked in the past does not mean that they will continue to work in the future.